Elie Wiesel, the Nobel Peace Prize winner, has died. I was never a fan of him in spite of his many successes in life, mostly selling for the Holocaust industry as a survivor from the Nazi camp. I found him fake and considered him a disingenuous person: a hypocrite of our time. Elie lied a lot. He was in the habit of making things up, in a way that his many subsequent detractors could identify as not untypical of his modus operandi: grasping with deft assurance what people important to his future would want to hear and, by the same token, would not want to hear. Alexander Cockburn writes, "There are some rather comical instances of Wiesel’s relaxed attitude to autobiographical truth, as excavated in Norman Finkelstein’s book, The Goldhagen Thesis and Historical Truth. Wiesel was one of Goldhagen’s main supporters. In his 1995 memoir, 'All Rivers Run to the Sea,' Wiesel writes that at the age of 18, recently liberated from Auschwitz, “I read The Critique of Pure Reason [don’t laugh!] ­ in Yiddish.” Finkelstein comments, “Leaving aside Wiesel’s acknowledgement that at the time ‘I was wholly ignorant of Yiddish grammar’, The Critique of Pure Reason was never translated into Yiddish.” Imagine the lacerations Frey would have endured for making that sort of empty boast." 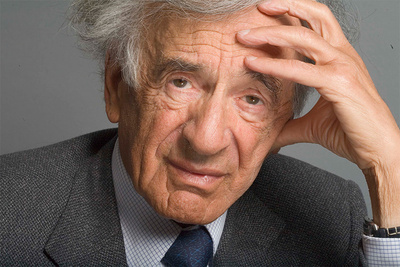 Wiesel famously said: “Wherever men and women are persecuted because of their race, religion, or political views, that place must — at that moment — become the center of the universe.” Wiesel also said “Indifference, to me, is the epitome of evil” and “When human lives are endangered, when human dignity is in jeopardy, national borders and sensitivities become irrelevant”. Yet Wiesel, the self-adulating guardian of the weak and the innocent, is in conflict with Wiesel, the Zionist and shameless apologist for Israel’s ongoing ethnic cleansing campaign and serial butchery in Lebanon and Gaza. He was criminally silent on such crimes, when he said, “I swore never to be silent whenever and wherever human beings endure suffering and humiliation. We must always take sides.” In the Middle East Wiesel has made his choice and it is to champion the powerful against their victims and to defend the occupier against the dispossessed. If it's not hypocrisy, what is? Eli's hypocrisy was quite obvious in the early days of the Bosnian crisis, too, when nearly a quarter million Bosnian Muslims were slaughtered. [Interested readers may like to read my comments from those days to understand his highly deplorable double-standards.] After some harsh criticism, he later changed his position and became a supporter for the cause of survival of the Bosnian Muslims, and that too, with some reluctance. Wiesel was for war against Iraq when the case was not there for invading Iraq for the supposedly WMDs. He urged George Bush for the war on Iraq as a necessary moral act, declaring that “the world faced a moral crisis similar to 1938” and “the choice is simple”. He was wrong and delusional! In Koteret Rashit, a liberal weekly, the Israeli journalist Tom Segev wrote of Wiesel: “He is always careful not to criticize his nation. . . . What does he have to say about the situation in the territories? When people from Peace Now asked him to criticize the Lebanese War he evaded the request. He’s never been in the habit of standing up seriously against Israeli leaders. . . . What in fact has he done to realize his fine intentions? Bob Geldof has done more. . . . How nice it would have been if they had divided the prize among those truly good people of the world, those still alive, those people who endangered their lives at the time of the Holocaust in order to save Jews. Elie claimed to be against terrorism, and yet upon release from the Nazi camp, he joined a terrorist organization Irgun in 1947, which had already earned the reputation for bombing and shooting scores of innocent Arabs in Palestine. In the 1930s the Irgun planted deadly bombs in Arab marketplaces, most notably in Jaffa, Haifa, Jerusalem and Tel Aviv. They also blew up buses and trains. By the mid-1940s the Irgun put the British colonial government in its sights. In 1946 the terrorist group killed 91 people in a Christmas bombing of the King David Hotel. They also kidnapped, tortured and hanged two British Army sergeants. And in an outrage which occurred after Wiesel joined the Irgun, the group killed some 254 unarmed Palestinian civilians at Deir Yassin in order to terrorize Palestine’s Christian and Muslim population and encourage their flight. As aptly noted by John Taylor (in a 2014 article), "Lying about Israeli ethnic cleansing was not enough. Wiesel, ever the propagandist, even tried to discredit the Palestinian struggle against Zionism by conflating indigenous Arab resistance with Nazism. Wiesel wrote in his autobiography, All Rivers Flow to the Sea, “gangs loyal to the grand mufti, the pro-Hitler Haj Amin el-Husseini, former ally and protégé of Himmler, attacked Jewish villages and convoys.” Of course Wiesel said nothing about Avraham Stern, leader of an Irgun splinter group, the Lehi, who actually sought an alliance with the Nazis against Great Britain during World War II." Wiesel has been called a “contemptible poseur and windbag” and the “resident clown of the Holocaust circus.” I shall remember Elie as a weasel only, and not one who had any moral compass. A private funeral was held for him last Sunday in New York. The question arises: who was more biased, the Nobel Peace Prize Committee who awarded the prize to Wiesel, or the critics who think he did not deserve it. They cannot both be right!